GLENDALE, ARIZONA --- Phoenix Coyotes General Manager Don Maloney announced today the Coyotes have signed free-agent center Petteri Nokelainen (PEH-tuh-ree, noh-kuh-LAY-nehn) to a one-year contract. As per club policy, terms of the deal were not disclosed. Petteri Nokelainen. Photo by Getty Images. In 2010-11, the 6-foot-1, 200 pound Nokelainen appeared in 46 games for Jokerit Helsinki of the SM-liiga (top professional ice hockey league in Finland) recording 11-16-27 and 116 penalty minutes. Nokelainen also played 9 games for Team Finland at the 2011 IIHF World Championships in Slovakia, helping his country win a gold medal by registering 1-1-2 and 8 PIM. This will be Nokelainen’s second stint with Phoenix after being acquired on March 3, 2010 from the Anaheim Ducks. 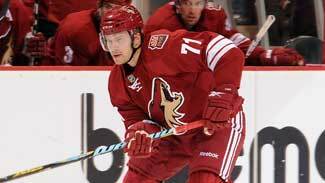 In 2009-10, he played 17 games with the Coyotes, registering 1-1-2 and 6 PIM. In 2007-08, the 25-year-old native of Imatra, Finland set career-highs in goals (11) and games played (57) while playing for the Boston Bruins. In 189 career NHL games with the New York Islanders, Bruins, Ducks and Coyotes, Nokelainen has recorded 17-17-34 and 66 PIM. He represented Finland in the 2004 and 2005 IIHF World Junior Championship tournaments and was originally drafted by the Islanders in the first-round (16th overall) of the 2004 Entry Draft. ► EDITOR'S NOTE: Click here to listen to an interview with Nokelainen conducted on May 20.